Sumo Logic published the 2018 Global Security Trends in the Cloud report, a research study conducted by Dimensional Research to uncover today’s security challenges IT teams face as they continue to adopt cloud architectures and invest in modern applications. It's no shock that as application architectures are being modernized and deployment processes are being updated, operations and security professionals are quickly finding that the old ways of the past are failing for the new world of cloud and modern applications. Traditional security tools built for on-premises simply can't keep pace with the rate of technological innovation as cloud becomes king and we move toward a convergence of development, security and operations (DevSecOps). Because these legacy tools are failing, organizations don't have a handle on their data, and therefore on their security. In a world dominated by near daily headline-breaking cybersecurity breaches, being able to quickly identify, prioritize and remediate potential threats is imperative. And to top it all off, infosec pros are under immense pressure to comply with new and evolving privacy and compliance standards such as PCI, HIPAA and GDPR. What organizations need is an entirely new approach for practicing security in the cloud, and a cloud-native security analytics solution built to handle today's modern IT environment. The survey was conducted in March 2018 and included a total of 316 qualified independent sources of IT security professionals across the U.S. and Europe, the Middle East and Africa (EMEA). 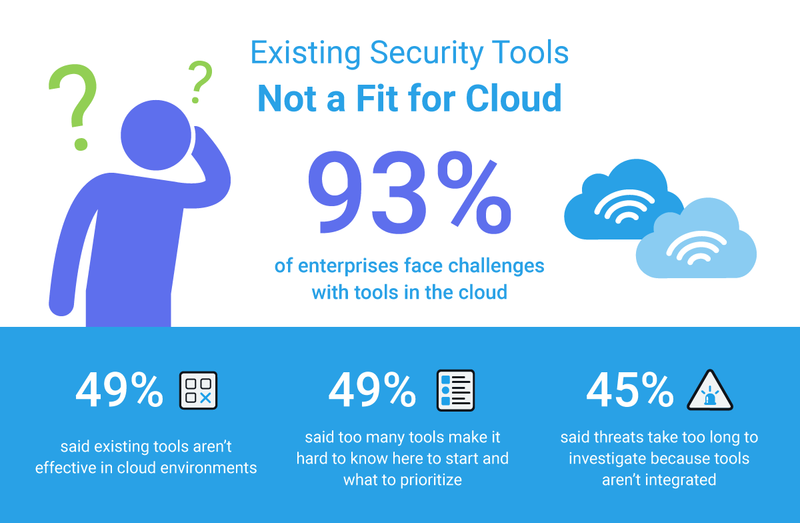 A range of questions were asked about cloud and on-premises security, including specific tools and organizational challenges, benefits and adoption patterns. All participants were responsible for security in environments in both public cloud and on-premises infrastructure. To learn more about the security and IT challenges global organizations face as they adopt modern applications in the cloud, download the report.